We invite you to visit our showroom. The equipment on our displays are powered up and operating. We have the largest operating display of marine radar in the NW. The ideal location of our showroom on the south shore of the Columbia River ensures several miles of Columbia River boat traffic are visible to our radars. A LIVE radar demonstration at our store is the only way to really compare performance of the many different antenna types and display technologies. Our marinized computer demonstration area has a variety of exciting software programs installed for demonstration and training. We have a on-the-air HF radio station operating on Marine SSB and ham frequencies, and can demonstrate the new PACTOR 3 protocol now used with Airmail software, offering fast onboard email communications via short wave radio. The new Skymate Wireless satellite communications system is on display for live demonstration of this affordable new system. We also have live operating displays of real-time weather reception systems by WxWorx on Water and Sirius Marine Weather. When buying marine electronics, look for people who can be helpful and explain things well. We strive to provide service that is beyond your expectations. When you come in to our store, you will be greeted by one of us and that person will remain with you, or you are welcome to browse. 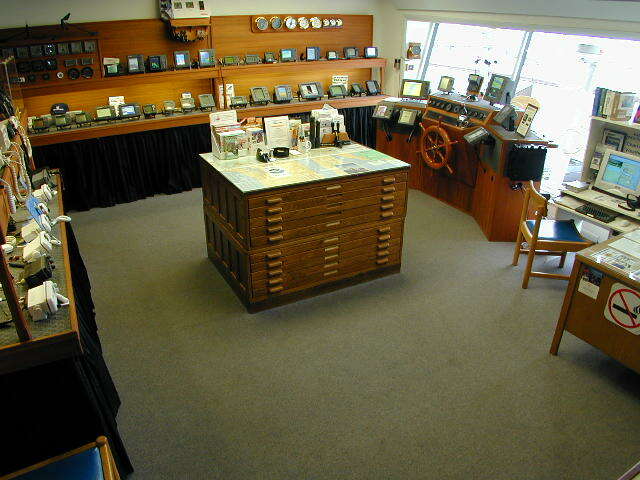 All of us here at Rodgers are knowledgeable in a wide range of marine electronics and systems. In addition, each of us have particular areas that we specialize in. The person with the expertise you need will meet with you. We are committed to "NO-PRESSURE" sales. We are not paid on commission. We believe this policy provides the best environment to satisfy your needs. During your visit we'll learn about your requirements and make recommendations that will provide the best results for you. Our equipment prices are very competitive. We will match local and mail-order competitors in-stock advertised/confirmable prices and terms on items we normally carry in stock. When shopping for electronics it is wise to consider the "total cost of ownership" of a product. This includes the dollars paid for the item, plus shipping costs, technical support - setup assistance & operation training, and sales taxes. With this in mind, you'll discover that your "total cost of ownership" is lowest when you shop at Rodgers Marine Electronics.